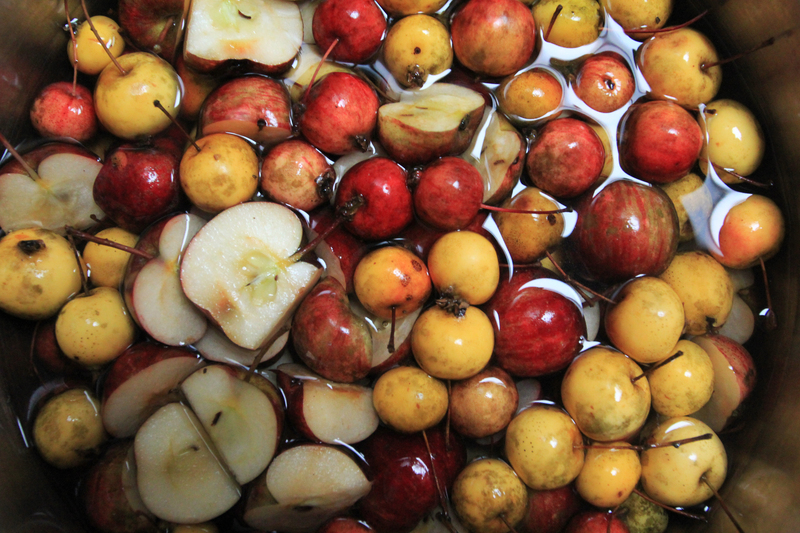 Crabapples being rinsed: cut bigger apples in half to help them cook faster. Oh the joys of crabapples. This tart orb most commonly associated with city parks is an often overlooked fruit that can magically transform any apple recipe. The sourness that turns most people off the tiny apple is also it’s appeal. Surprisingly, they carry a complicated depth of flavor that is excellent on its own, but also pairs well with sharp cheeses, hearty breads, and rich meats like pork and duck. Crabapples can still be harvested once the leaves are on the ground, and some varieties store very well in a root cellar. Crabapples are the same species as the Galas and Granny Smiths we take home from the store, they are simply a different variety. 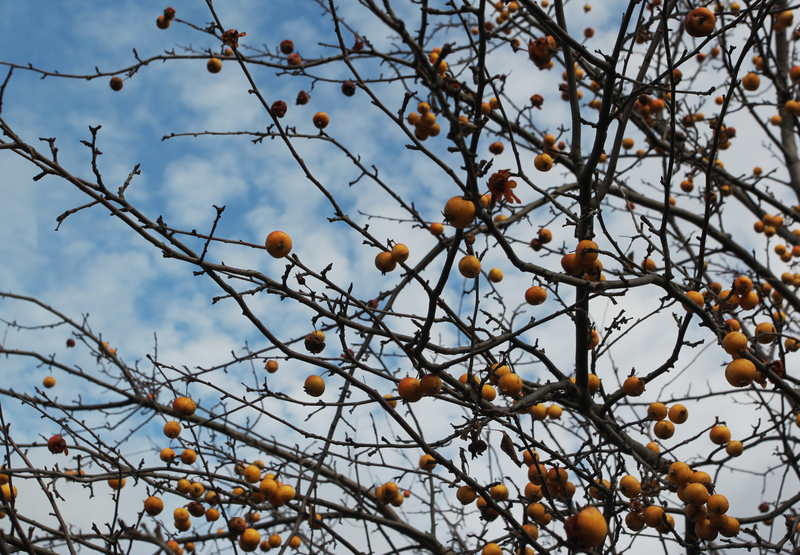 The seeds that drop from an apple do not grow true to type; meaning if you plant an apple seed from your leftover core you will get a completely new variety of apple tree growing from it, possibly even a type of crab. Look for apples in the fall and even the early winter. As long as the fruits are not soft they are good to eat (and even a little softening is okay). The biggest problem with crabapples is their size! It makes them more difficult to peel and core than a conventional sized apple. I don’t want to spend all afternoon peeling the suckers. I have better things to do…like eating them. SO, instead of completing this time draining task, I tend to cook the apples in ways that do not require so much tedious effort. One of these ways is by making apple butter (see my recipe for crabapple butter). 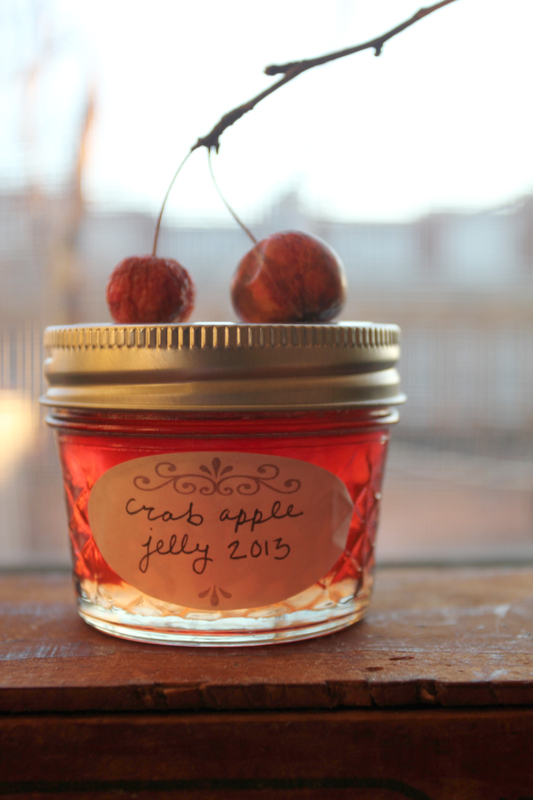 But an even less monotonous-task laden recipe to make with crabapples is jelly! It is almost as simple as throwing some fruit in a pot and letting it cook…with a few more steps thrown in. The pectin in the skin and cores does most of the work, you are needed for is a bit of straining, stirring, and pouring. The resulting concoction is a beautiful amber colored gel that glows when light shines through it. It is sweet, and tart, with a luscious texture you won’t be able to turn down, even on a paleo diet. Be inventive in how you serve it. Pair it with sharp or smokey cheeses, put it on your toast, use it as a glaze on ham or duck, or go old school and have yourself a classed up version of the classic PBJ. However you eat it, you will end up wanting more, so go the extra mile and make a double batch. You will not regret it. Wash all the crabapples, cut the big ones in half. Place the apples in a stock pot and fill with water until the water reaches just below the top of the apples. Put the apples on high heat until they boil, then reduce to a low boil for 2 hours. Remove from the heat and let cool to almost room temperature. Place a cheese cloth that has been folded over in a wire strainer. Put the strainer in a large bowl and pour the stewed apples through the strainer. This separates the liquid from the solid parts of the apples. Let the remaining apples sit in the strainer overnight to get as much juice out as possible (do not squeeze as it makes the jelly cloudy. 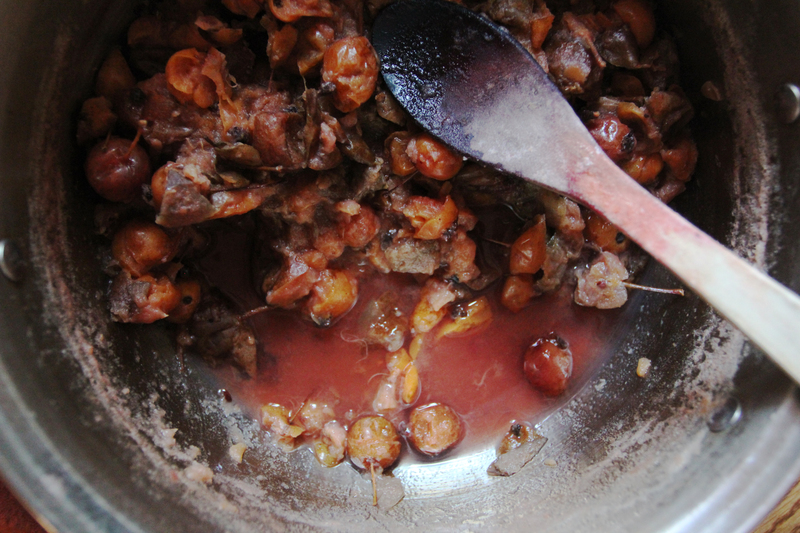 What remains: the leftover crabapple “guts” after the juice has drained out. The next day pour the juice in a jelly pan or wide stock pot. Add the sugar and heat, stirring occasionally, until the mixture boils to ensure that it sets. It should start to foam, but not foam over the pan. Once it has reached this stage you can remove it from the heat and either put it in refrigerator jars or canning jars. If canning, you will need to process the jars in a water-bath canner for 6-15 minutes (see below). Let the jelly cool and it is ready to eat! Or you can let it cure for 1-3 months to develop more intense flavor (canned jelly only). Recommended process time for Apple Jelly in a boiling-water canner. A super simple 3 ingredient recipe, and a perfect undertaking for a cold rainy weekend stuck in the house. Let me know how yours turns out!